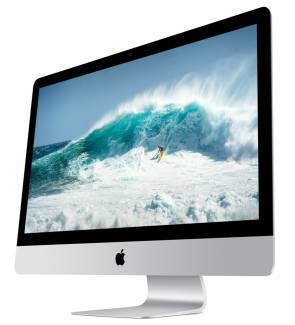 GainSaver is the place to save on a refurbished Mid 2015 27-inch Retina 5K iMac. This is a Mac that everyone wants to own! With its 5120 x 2880 resolution, the display on the discount 27-inch Retina 5K iMac is truly remarkable. Its perfect for artists, video editors, game lovers, scientists and business execs that need a sharp, vivid display for both graphics and text. Why GainSaver? Because we guarantee that you will be totally satisfied with your purchase or well refund your money. Our 30 Day Money Back Guarantee means you can return your order for any reason  no questions asked. But we know you wont. Once you see how much money youve saved on your incredible pre-owned Mid 2015 Retina 5K iMac with fourth generation Intel processor, high speed Wi-Fi and Thunderbolt 2 ports, youll never give it up. We guarantee! Youve never seen anything like the incredible display on the pre-owned Mid 2015 27-inch Retina 5K iMac. Its called 5K because it has over 5,000 pixels of horizontal resolution. With its 5120 x 2880 resolution, the refurbished 27-inch Retina 5K iMac has over 14 million pixels in all. Thats so many pixels that you cant make them out individually. Looking at your graphics and games on the refurbished 27-inch Retina 5K iMac is like looking out the window, the picture is that sharp. With such a high resolution desktop, you wont miss a thing when designing, doing photo retouching, editing HD video, playing your favorite games or taking in massive spreadsheet files in one panoramic view. Need lots of windows and applications open at the same time? Not a problem on the Mid 2015 27-inch Retina 5K iMac. You have practically unlimited room for icons, folders and windows all open at the same time. Apple didnt forget about the audio experience when they made the Mid 2015 27-inch Retina 5K iMac. Just as the screen is stunningly clear, so is the sound quality. Its hard to believe that the high-fidelity speakers are built into such a narrow enclosure that is only 5 mm thick at the edges. Whether you are watching movies, enjoying your favorite musical recordings or immersing yourself in a great game, the sound quality keeps up with the image quality. What makes the 27-inch Mid 2015 Retina 5K iMac possible is the fast fourth generation Intel processor working with the blazing fast AMD graphics processor. After all, it takes a lot of computing hardware to keep 14 million pixels constantly updated. The 3.3GHz Intel Quad Core i5 processor in the Mid 2015 iMac incorporates Turbo Boost that will automatically kick up the speed to 3.7GHz any time you need it, like when you are using processor intensive applications like music recording or video production. Working with the Quad Core i5 processor is the AMD graphics processor that handles data processing for output to the 5K screen. Graphics are so fast and smooth that visual effects, games and even 3D graphics are so real it feels as if you are part of the action. When you shop GainSaver, you can order an amazingly fast, high performance Mid 2015 refurbished 27-inch Retina 5K iMac and make it even faster! GainSaver technicians can install a bigger hard drive or more memory for you that can increase performance even more. With more memory you can work with larger data files. And if you choose to upgrade to a bigger hard drive or flash drive, you can store more movies, video clips, games, song files and database files without the need to access the internet or external storage devices. Just select the configuration you want before you check out. Then click the Buy button to continue.